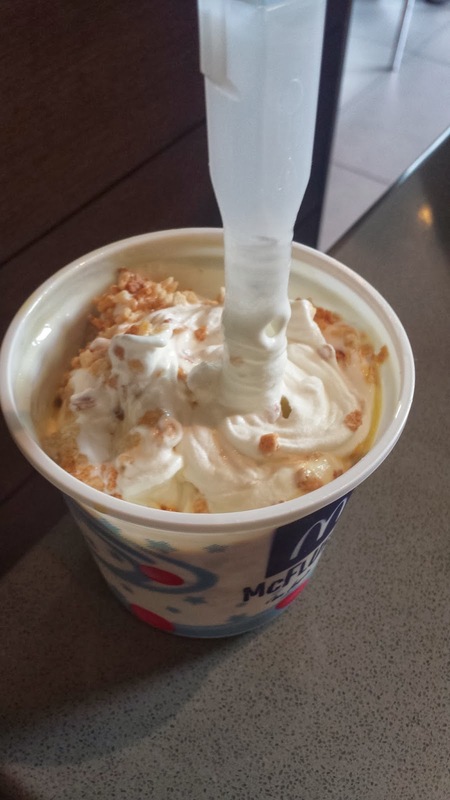 Sometime between when I left for Canada & The US in the middle of December to when we returned to Singapore in January the new Passionfruit Crunch McFlurry was launched. Though I noticed it shortly after our return, I held out on trying it until my wife returned from her trip to Korea. Unlike the Prosperity Burger, which is now entering its 3rd straight month of being on sale (please get rid of it, it's time for something new), the promotional McFlurries are rarely available for longer than a month, so I didn't want to hold out that much longer. We tried it her first weekend back on a lazy afternoon after a long walk to the nearest mall which has a dessert kiosk. 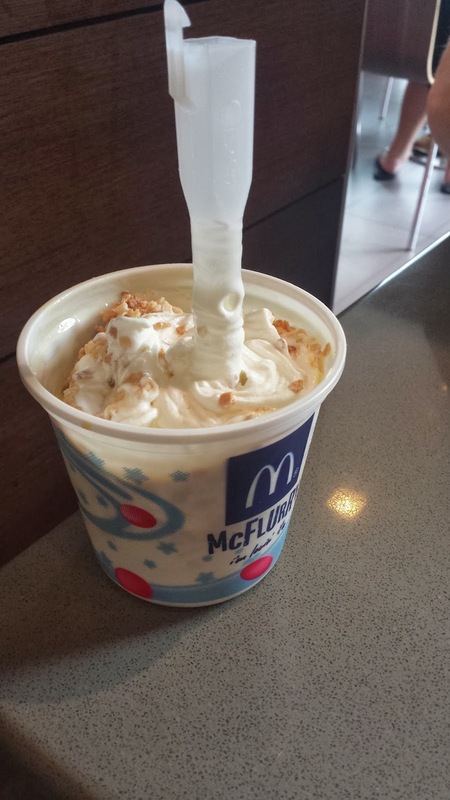 Promotional McFlurries in Singapore are only available at branches with a dessert kiosk, which is a small ice cream only sales booth, usually attached to a larger branch. Sometimes they are just standalone in the centre of the restaurant, or they could have their own window to serve both customers outside and inside. 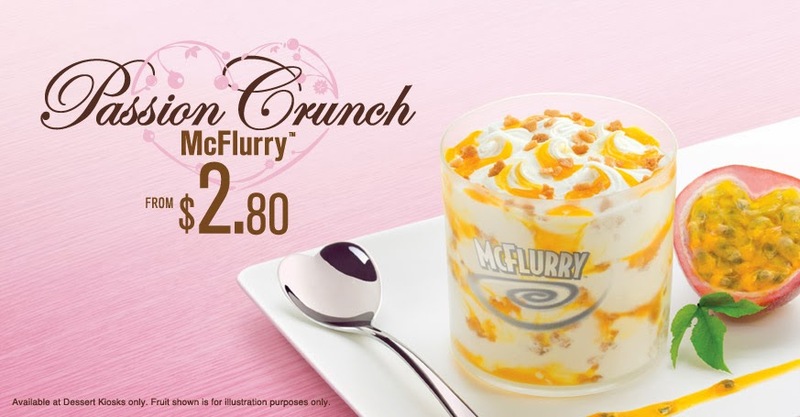 When I first read the name of the new McFlurry, and saw that it included "crunch", my first thought was "I hope they didn't ruin it again". This isn't the first time they've used "crunch" in the name. The first couple of times, this meant they mixed Oreo pieces with a new promotional flavour, like the Blueberry Crunch which wasn't that bad. But what they have done other times is mix the new flavour with these little stale rice crispy pieces, like more recently in the terrible Durian Crunch McFlurry, these little pieces are horrible, and I really don't like them in my ice cream, and that's exactly what was on this new McFlurry. 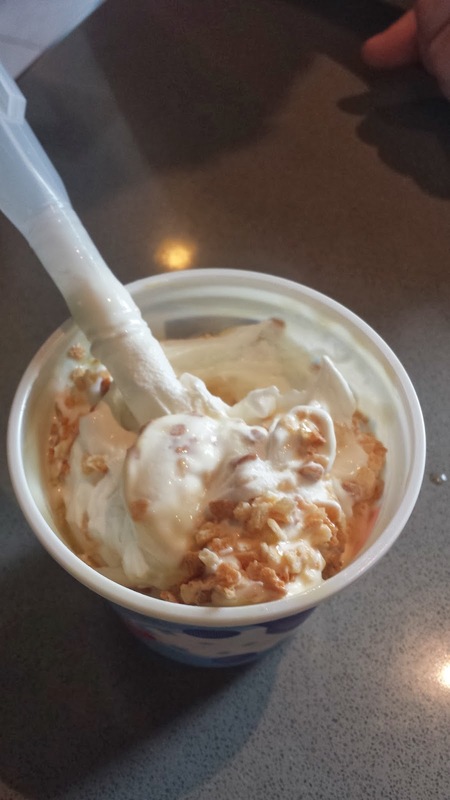 This also cannot be mistaken for Malysian "crunch" McFlurries, which have used everything from cereal, to butterscotch. Aside from the stale rice pieces, the passionfruit topping was noticeably artificial, and did not have real chunks of fruit in it like some of the others I've had. I was shocked about how much it didn't taste like passionfruit, that I thought for a split second that they might have given me the wrong one. It even tasted totally different to last years Passionfruit McFizz, which although wasn't great, wasn't anywhere near this bad. The aftertaste reminded me of the other gross Flavour Burst Cone I had last year. That one turned me off the flavour cones so much that I haven't even bothered to review any of their recent promo flavours, this one might turn me off any future "crunch" McFlurries as well.